Of course, personality can make a difference. People who rate high in openness to new experiences in personality tests also may be more easily distracted and curious, according to a 2010 study in Creativity Research Journal. Among 158 college students, those who were less inhibited and more receptive to lots of stimuli also were able to generate more ideas than others, says the study by British researchers. The 2013 BPRSDC Spring Reading List! The Cherry Blossoms are blooming and the sunshine has one again returned to the beautiful city of Washington, DC! To kick off this new season, we would like to share with you a few books that may come in handy as you begin your picnics in the park and sunbathing by the pool. 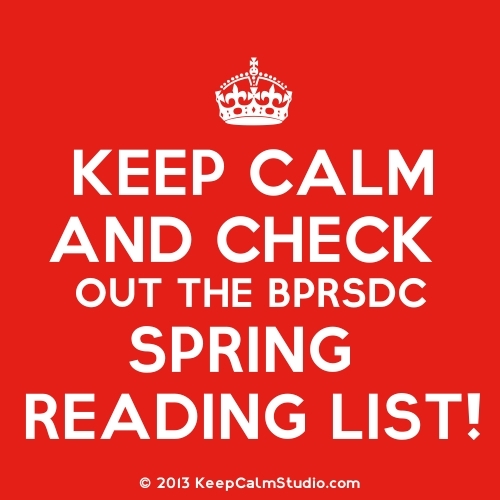 Here is the 2013 BPRSDC Spring Reading List. This “Top 10” reading list for spring provides thought provoking and motivating learning for public relations practitioners and communications professionals. This list is in no particular order. It contains many books that the BPRS executive board have found beneficial for personal and professional growth. Happy reading and happy Spring! Please look forward to upcoming Spring event announcements and please stay connected via our social networks via LinkedIn, Facebook, Twitter and Instagram! This series is intended for small business owners, independent publicists, nonprofit organizations, special events managers and individuals seeking ongoing media coverage for newsworthy topics. Mastering the art of pitching news stories takes skill. This survival guide provides information and advice for a novice publicist or seasoned public relations practitioner. Topics include: public relations, publicity, marketing, social media, sponsorship, branding, pitching stories to news media and moral and ethical behavior in public relations. Many professionals sabotage their careers and sacrifice job satisfaction because they don’t know how to overcome obstacles to career success. Arthur D. Rosenberg gives them tips and techniques to beat these career barriers. His book, “101 Ways to Stand Out at Work: How to Get the Recognition and Rewards You Deserve (2009)” identifies the elements of a successful career and lays out steps that help workers become more engaged at work. Candid, practical advice shows the reader how to counter weaknesses, correct damaging behaviors, defuse political situations, communicate for better control, and more. This guide is for the career climbing professional who wants to earn a promotion or raise, and get better assignments. In this provocative and persuasive new book, New York Times best-selling author Daniel H. Pink asserts that the secret to high performance and satisfaction-at work, at school, and at home—is the deeply human need to direct our own lives, to learn and create new things, and to do better by ourselves and our world in “Drive: The Surprising Truth About What Motivates Us (2011)”. Drawing on four decades of scientific research on human motivation, Pink exposes the mismatch between what science knows and what business does—and how that affects every aspect of life. People decide who to trust, what advice to heed, and which individuals to forge personal or transactional relationships with based on a simple metric of believability. Success, in turn, comes from understanding one basic principle: how to be more trusted. Rohit Bhargava’s “Likeonomics: The Unexpected Truth Behind Earning Trust, Influencing Behavior, and Inspiring Action (2012)” offers a new vision of a world beyond Facebook where personal relationships, likeability, brutal honesty, extreme simplicity, and basic humanity are behind everything from multi-million dollar mergers to record-breaking product sales. If the name Randal Pinkett sounds familiar, it may be because Pinkett was the first African-American winner on NBC’s “The Apprentice”. When he won, this black man also became the only contestant to be asked to share his victory with a white woman. The request (and Pinkett’s subsequent refusal) set off a firestorm of controversy that inevitably focused on the issue of race in the American workplace and in society. “Black Faces in White Places: 10 Game-Changing Strategies to Achieve Success and Find Greatness (2010)” is about “the game” that is, the competitive world in which we all live and work. Pinkett’s book offers 10 revolutionary strategies for playing, mastering, and changing the game for the current generation, while under taking a whole sale redefinition of the rules for those who will follow. Forget the “pitch”: Yesterday’s PR techniques just don’t work anymore. That’s the bad news. Here’s the great news: social media and Web 2.0 offer you an unprecedented opportunity to make PR work better than ever before. In “Putting the Public Back in Public Relations: How Social Media Is Reinventing the Aging Business of PR (2009)” you’ll learn powerful new ways to build the relationships that matter, and reach a new generation of influencers…leverage platforms ranging from Twitter to Facebook…truly embed yourself in the communities that are shaping the future. Best of all, you won’t just learn how to add value in the Web 2.0 world: Brian Solis tells you how to prove how new, intelligent, and socially rooted PR will transform your organization into a proactive, participatory communication powerhouse that is in touch and informed with its community of stakeholders. Thirty years after women became 50 percent of the college graduates in the United States, men still hold the vast majority of leadership positions in government and industry. This means that women’s voices are still not heard equally in the decisions that most affect our lives. In “Lean In: Women, Work, and the Will to Lead (2013)” Sheryl Sandberg examines why women’s progress in achieving leadership roles has stalled, explains the root causes, and offers compelling, commonsense solutions that can empower women to achieve their full potential. Sandberg is the chief operating officer of Facebook and is ranked on Fortune’s list of the 50 Most Powerful Women in Business and as one of Time’s 100 Most Influential People in the World. The secret to successful word-of-mouth marketing on the social web is easy: BE LIKEABLE. A friend’s recommendation is more powerful than any advertisement. In the world of Facebook, Twitter, and beyond, that recommendation can travel farther—and faster—than ever before. Dave Kerpen’s “Likeable Social Media: How to Delight Your Customers, Create an Irresistible Brand, and Be Generally Amazing on Facebook (And Other Social Networks) (2011)” helps you harness the power of word-of-mouth marketing to transform your business. Listen to your customers and prospects. Deliver value, excitement, and surprise. And most important, learn how to truly engage your clients or customers and help them spread the word. Corporate executives are struggling with a new trend: people using online social technologies (blogs, social networking sites, YouTube, podcasts) to discuss products and companies, write their own news, and find their own deals. This groundswell is global, it s unstoppable, it affects every industry and it’s utterly foreign to the powerful companies running things now. When consumers you’ve never met are rating your company’s products in public forums with which you have no experience or influence, your company is vulnerable. In “Groundswell: Winning in a World Transformed by Social Technologies (2008)” Charlene Li and Josh Bernoff explain how to turn this threat into an opportunity. Whether we’re employees pitching colleagues on a new idea, entrepreneurs enticing funders to invest, or parents and teachers cajoling children to study, we spend our days trying to move others. Like it or not, we’re all in sales now. “To Sell Is Human: The Surprising Truth about Moving Others (2012)” offers a fresh look at the art and science of selling. Author, David H. Pink makes our list again because he reveals the new ABCs of moving others (it’s no longer “Always Be Closing”), explains why extraverts don’t make the best salespeople, and shows how giving people an “off-ramp” for their actions can matter more than actually changing their minds. Along the way, Pink describes the six successors to the elevator pitch, the three rules for understanding another’s perspective, the five frames that can make your message clearer and more persuasive, and much more. The Second Edition APR Study Guide is a key tool in preparation for Accreditation in Public Relations and a tremendous resource for all APR candidates. Produced by the Universal Accreditation Board, the Guide is the product of many hours of research and evaluation. It contains exercises, case studies and insight into modern public relations practices. And, it’s available at no cost to those pursuing Accreditation. The survey was developed by The Creative Group, a specialized staffing service for interactive, design, marketing, advertising and public relations professionals. It was conducted by an independent research firm and is based on more than 750 telephone interviews — approximately 575 with marketing executives randomly selected from companies with 100 or more employees and 175 with advertising executives randomly selected from agencies with 20 or more employees — in the United States and Canada. Creative professionals often have unique “tastes,” and these individuals were no exception as evidenced by the snacks found in their offices. To find out what else was found on the desks of creative professionals, read here. Nearly a third of consumers said they have abandoned a news outlet because it no longer provides the news and information they had grown accustomed to, according to a new report by the Pew Research Center’s Project for Excellence in Journalism. Among the people who left a news outlet, 61% of the respondents said that the stories were less complete than they had been, the survey added. Pew’s annual “State of the News Media” report shows that newsroom employment is down 30% since 2000 and has dropped below 40,000 people for the first time since 1978. And fewer reporters and editors means fewer people engaged with the news. The survey, which took the pulse of 2,000 consumers, found that 28% of adults under age 30 counted themselves as regular local news viewers, down from 42% in 2006. For PR folks, the shrinking of traditional newsrooms continues to turn media relations on its head.